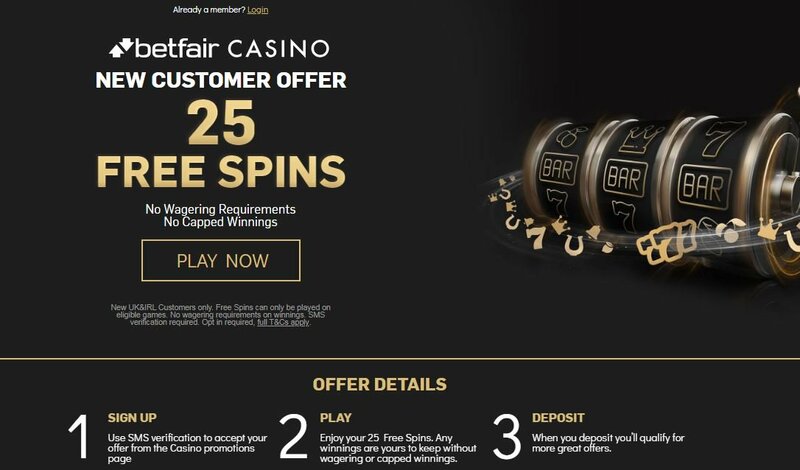 Betfair Casino 25 No Deposit Free Spins! No Wagering, No Capped Winnings! Betfair Casino has launched a new unmissable offer for new customers! You can claim 25 No Deposit Free Spins, with no wagering requirements and no capped winnings. This means that any winnings are yours! It's the best casino offer on the Internet! Betfair are certainly better known for their sportsbook and betting products, but the casino does a fine job too. They’re offering all newly registered accounts 25 Free Spins No Deposit. Your new casino account will give you access to some of the biggest and best slots available on the internet with options from Netent, IGT and many more. The 25 no deposit spins come with the added benefit of having no wagering requirements! It means that you can play your free spins and keep what you win! Betfair Casino is fully powered by Playtech and the provider supplies the site with three gaming platforms in total: online casino, live dealer casino and mobile casino. Of course, you can also play games devolped by Netent, IGT, Nextgen Gaming, NYX and many more of the hottest online casino providers. You’ll get a free 25 No Deposit Free Spins Bonus to play the best casino games with no wagering requirement on winnings. If you’re ready to take your experience to the next level, then deposit £10 and play with £60. Fast and secure withdrawals, plus a very appreciated Customer Service. Wanna play live casino? You have 30 FREE CHIPS bonus with no deposit required! This offer is only open to new players from United Kingdom and Ireland - aged 18 or above - who have never before played Betfair Casino or Live Casino. You have to accept your free spins and start playing any of the eligible games. The spins are valued at 1p per line and are valid for 7 days. Winnings from the free spins have no wagering requirements. "Betfair Casino 25 No Deposit Free Spins! No Wagering, No Capped Winnings!"